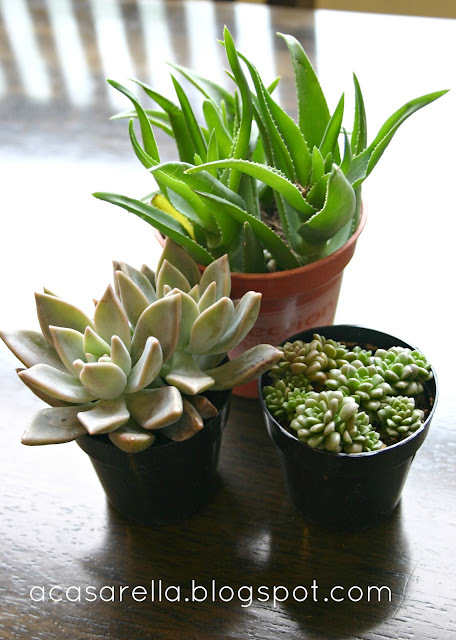 So by now we all know that I have a thing for succulents. 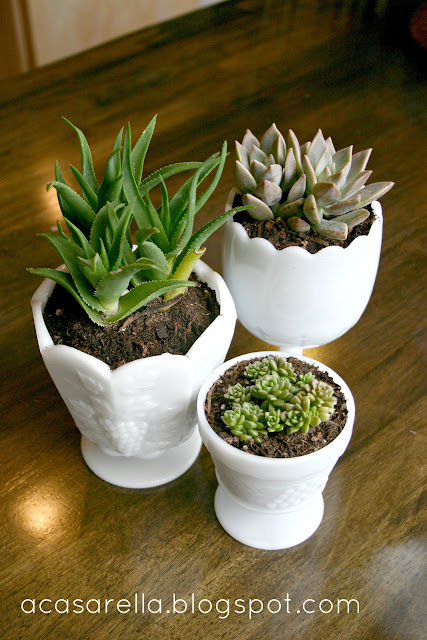 For those of you who didn't click on those links--and you should really click on the links, people--I'm talking about succulents planted in milk glass! How great is that? At $1.99 apiece for the little ones and $2.49 for the bigger one they were a bargain. The milk glass was also inexpensive, I think these three cost about $6.00 total at Goodwill. ...perfect for a wedding, or in this case, a marriage of two obsessions! Wow how pretty! Great idea!! Elena, I own one piece of milk glass. (It's not as pretty as yours, but I like it and I don't know why I don't have more.) Now I know what to do with it and I happen to be going to town later this week, so I'll swing by Home Depot. Yours look so elegant in those containers. Perfect! May they live happily ever after. was it wrong that i was "shopping" your milk glass shelf, lol? 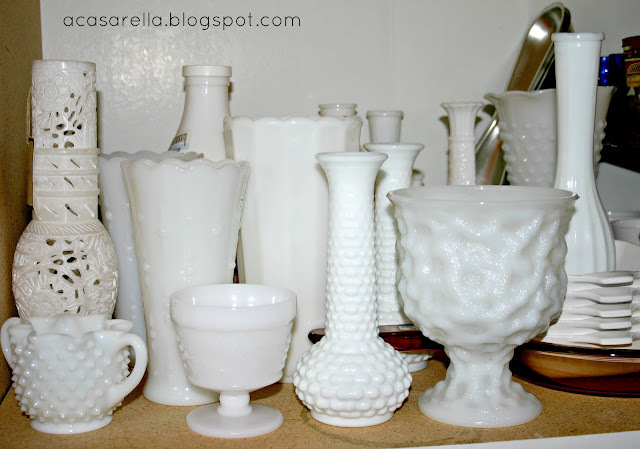 we recently added open shelving in our kitchen, and i accessorized with some of my milkglass collection. love it! oh my, you're a lady after my own heart. Love these little guys and totally gonna copy 'em. That is such a great idea. Lovely! This is so beautiful. I love this display. I have a link party on Wednesdays, and I would love it if you would link this and any other posts. It is called Wednesdays Adorned From Above Link Party. It runs from Wednesday to Sundays. Very clever and they look great! I love it! Those are just too cute in those glasses. Thanks for sharing at The Fun In Functional! Yeah, great idea! I have a pretty big collection of milk glass. Interestingly enough, my milk glass is also incorporated into the idea I linked up (at "I Gotta Create"). Funny. I think I'll definitely use this in the future. It would be my pleasure to link up. Thanks for the invite! Those milk glasses are beautiful and the finished product is great! This is so very pretty. I love the simplicity and understated elegance of it. I am your newest follower. I'd love for you to stop by Posed Perfection for a visit and maybe even a follow back. Have a great weekend! 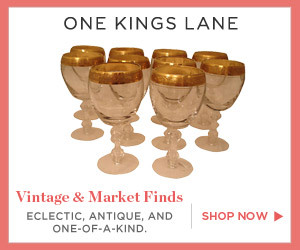 Very pretty - I, too, thrift for milk glass. May have to get me some succulents to put in them - yours are so pretty. this display is so great, perfect for coming into our summer. They are so pretty. I need to start keeping an eye out for milk glass. 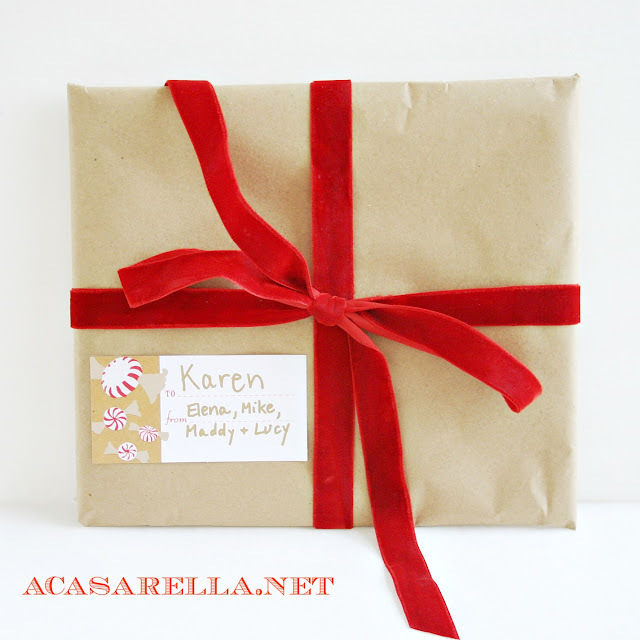 Thank you for sharing at the Our Favorite Things Link Party. I love it! Those turned out so pretty! Wow, how creative to use these for flowers pots. My hubs love succulents, and these would look great inside. 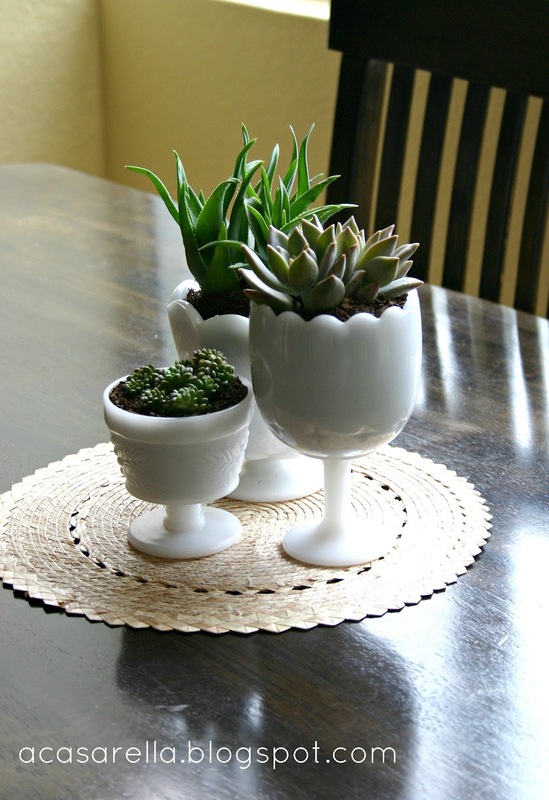 Loving the milkglass and succulents together, seem to compliment each other. Thanks for sharing your creative inspiration with Sunday’s Best – you helped make the party a success! 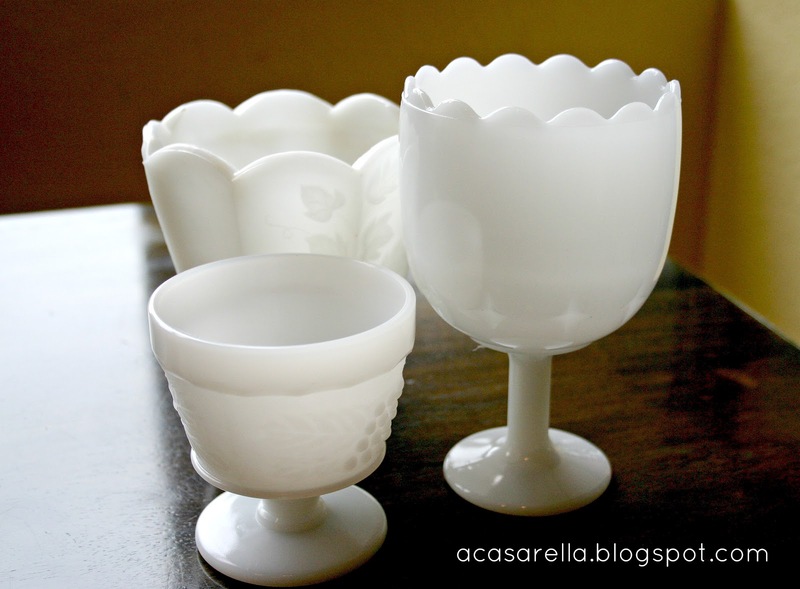 I love milk glass and these are absolutely beautiful! They look so chic. I really want to try these. Thank you so much for linking up to HAPPY HOUR this week! Oh pretty! I have tons of milkglass and succulents in a colander out on my porch. It's time to bring them inside. Now I know where I'll replant them! This is such a great way to marry your obsessions! Love it! Hmmm....now I may have to go back to the obscure little thrift store down the street and buy the milk glass pieces I saw a few weeks ago. Love the succulents! Elena! This is really a great idea. I would love to do this and put them on shelves. Thank you for linking up to Throwback Thursday! I am in love with milk glass and I was reading an article on succulents just the other day. I'm so doing this! Thanks for linking up at Throwback Thursday!